Kilimanjaro is a trekkable Mountain and the walks, where they around sea level would be relatively easy – it’s the altitude that makes this such a tough climb. Altitude and altitude sickness are the aspects of the climb that worry most people even if you have been to altitude before. So why is altitude a problem? Putting it very simply the air pressure reduces as you climb higher. In every litre of air there are less molecules of all the constituents of air, most importantly for us, fewer oxygen molecules. At the top of Kili you are getting roughly half the number of oxygen molecules per breath than you would at sea level. Our bodies need oxygen to function and create energy. In response to less oxygen your body goes through a number of physiological changes. One is to build more red blood cells (the oxygen carriers). This is why athletes often train at altitude, a higher concentration of red blood cells improves performance. However this takes time to complete, usually around 3 weeks. In the meantime your body carries out ‘emergency procedures’ as a coping strategy. These result in deeper and faster breathing. Shortness of breath on exertion and increased frequency of urinating. You may also experience disrupted sleep, night time urination, disrupted breathing during sleep and weird altitude dreams. These are all entirely normal responses. So you can start to feel pretty bad at altitude. The critical threshold is at 4200m (about 13,775ft). The upshot is that your need to rest, drink a lot of liquids, preferably water, and keep on eating. In order for your body to adapt your ascent should be slow. Advice these days is to walk higher during the day than your sleeping altitude, the walk high sleep low maxim. Sleeping altitudes should not be increased by more than 300m per day. Following this advice an ascent of Kili would take around 12 days-2 weeks. Why do we ascend Kili more quickly? To be honest the main reason is simply tradition. In the past many climbs were done over 4 days, up and down! It has also been done in 1 day by a very few dy individuals but we wouldn't recommend it! Over the years the time spent on ascent has extended. More recently, we are seeing more and more climbers sensibly opting for 7 and 8 day climbs. Altitude sickness is officially called Acute Mountain Sickness (a.m.s.). usually will start to kick in around 2500m -3000m above sea level (a.s.l.). A.m.s can be broadly categorised into mild, moderate and severe. You may experience one or all of these symptoms and they can last anything from several minutes to several hours. Mild symptoms are actually quite normal on an ascent up Kilimanjaro. You shouldn’t panic if you experience any of them but you must tell your guide. We want to monitor your health at all times for your safety and comfort. Again one or all may present. Moderate symptoms need to be monitored closely by your guide. With both mild and moderate symptoms it’s usual that after drinking water or other liquids, food and rest they will start to abate. Headaches can be treated with paracetamol/ibuprofen. However, if your symptoms show no improvement or if they worsen your guide will make a judgement on your ability to continue. These usually manifest as repeated vomiting and/or severe headache that does not respond to pain killers and extreme fatigue. Descent is the only option here. We understand how unnerving your first time to high altitude can be. We’ve all been up there for the first time too. We feel that one way of roughly assessing yourself is to use what we call the ‘hangover scale of a.m.s.’. You may have noticed that the symptoms of a.m.s have a strong correlation with a hangover. So, if you feel like you a beer or two too much last night, you have mild level a.m.s. This is normal, nothing to worry about but tell your guide. If you feel like you had several beers or a bottle of wine too much last night, you have a moderate response. You must tell your guide. It’s highly likely that your symptoms will abate but your guide will need to monitor your progress carefully. If you feel like you had several tequilas too much – it’s time to descend immediately! 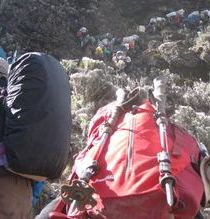 Some climbers may experience some level of a.m.s almost daily that then resolves and ascent can continue and make successful summit to Uhuru Peak. Some climbers may only experience some mild symptoms on the final ascent. We are all different. There are many factors that can affect an individuals’ response to altitude at any one time and still much of the physiological mechanisms of acclimatisation are not yet fully understood. Even a person’s response to altitude can vary on different ascents. We know we’ve said this before (and we’ll say it again no doubt) but the best thing is to look after your body by walking slowly, resting, drinking lots and eating well. Our guides are trained in using the Lake Louise method of a.m.s assessment. They also carry pulse oximeters to measure your blood oxygen levels. We use these as an additional assessment tool when moderate a.m.s symptoms present. Again, people tend to have different ranges of normal levels and oximeters are not relied on as a stand-alone assessment method. They are two serious conditions that can occur at high altitudes. High Altitude Pulmonary Oedema (HAPE) and High Altitude Cerebral Oedema (HACE). Both of which are very rare. This is fluid build-up in the lungs. It can be life-threatening if early symptoms are ignored. If prompt action is taken then the symptoms resolve and leave no permanent damage. The early symptoms typically are: dry repeated cough, increasing fatigue, shortness of breath and elevated heart rate. These symptoms may have other causes so it may not be clear that HAPE is present at this stage. As the condition develops fatigue increases so that walking becomes difficult and shortness of breath is clear even at rest. This is without doubt HAPE and descent is essential. If symptoms are ignored fluid will continue to build up and reduce oxygen intake that further exacerbates HAPE. This can lead to frothy sputum and rattles when breathing, particularly when laying down. Descent is the only option preferably with supplementary oxygen being supplied. This is the build of fluid on the brain. This can cause severe headaches, loss of co-ordination, confusion, personality shifts and loss of consciousness. This is a serious life-threatening condition, descent is essential. How fit do you need to be to take the Kilimanjaro challenge on ? Well, the truth is you don’t need to be super fit. As long as you are in reasonably good shape it’s a do-able mountain to climb. Of course if your life is mostly sedentary then you should take up a training plan to prepare. The best training you can do is to mimic what you’ll be doing on the mountain and that’s walking up and down hills. Walking on the flat is ok for endurance building but your calf muscles will not be engaged in the same way. Also any kind of cardio exercise will help cycling, swimming or running. You’ll be using your legs a lot for the climb so strength work such as squats and lunges which will build up your thigh muscles are excellent. Most people are fine on the ascent but the descent can cause knee and thigh soreness. This is because your muscles are working in a different way (eccentrically). Strong muscles help enormously. Reverse squats are one of the best exercises to prevent the descent muscle soreness. Don’t forgget to stretch and keep muscles and flexible which also helps prevent injury. We recommend that you seek out a decent gym/trainer to help you prepare and allow a minimum of 3 months to get Kili fit. As your arrival and trek day approaches you’ll probably start to feel apprehensive – don’t worry, this is good ! Kilimanjaro is a big mountain and should be approached with respect. Some nervousness is normal and should drive you to prepare properly. Once you are on the mountain just take each day as it comes and enjoy the journey. Don’t focus on reaching the summit or worrying about altitude sickness as this can stress you. Rest assured our guides will be looking after you and please do tell your guides too and discuss your concerns – a problem shared is a problem halved. Equally talk with your fellow climbers and listen to them too. There’ll probably be days when they need help and other days when they will help you… its all about the team effort. Life-long friendships are often forged or existing ones truly cemented on a challenge such as this one. We recommend that you visit your medical practioner before climbing for a check up to ensure that you are fit enough to undertake a challenge such as this one. Also you'll need to discuss vaccinations and malaria tablets prior to travel. Although there's no malaria above 2,200m you'll still need to be covered for your time spent at lower altitudes. Malaria prophylactics don't prevent you from contracting the disease, though they can help, but they will prevent an infection building to a life threatening level. So it's important that you also bring mosquito repellent for your time at low altitudes. It not necessary for your time on the mountain as your first camp is well above 2200m so no risk of malaria. You may also wish to consider and discuss the use of 'Diamox' (Acetazolamide) which studies (and our experience) show that it seems to aid acclimatisation for the majority of climbers who use it. It can be taken as a preventative or as a treatment if and when ams symptoms appear. Please be aware though that it’s not suitable for everyone, and even if you are not allergic you may have side effects from the drug itself, typically tingling fingers and feet, so you must do a trial run with it before leaving home. You'll need to bring a simple medical kit for personal use - see your kit list section for the full suggested item list. included in this are painkillers - typically used for headaches you may have due to the altitude. We recommend brining a mix of paracetamol and ibuprofen. Ibuprofen also has anti-inflammatory properties and these 2 medicines can be taken in combination as they work in different physiological mechanisms. Your insurance must cover you for trekking up to 5895m altitudes. Many standard travel insurance policies do not have this level of cover so check before buying your policy. You’ll also need your policy to include medical, emergency evacuation and repatriation cover. We will not accept any climbers without adequate cover and it is your responsibility to arrange this before leaving home. Please ensure that you bring a copy of your documentation for us in case of any emergency, we can then contact the insurers on your behalf. This must include your policy number, date of expiry and 24 hour emergency medical helpline number. Most people will fly into Tanzania. We have an international airport nearby, aptly named Kilimanjaro International Airport (code JRO). It's just a 45 minute drive from there to the town of Moshi which nestles at the foot of Kilimanjaro. The ideal place to stay before and after your climb. You'll need a passport with a minimum of 6 months of validity from the date of your departure from Tanzania. Most nationalities require a visa to enter Tanzania. For UK and most European nationalities the visa fee is currently $50.00 and you can buy one on entry. For US citizens the visa fee is currently $100.00. Payments must be in cash and only in US dollars or Tanzanian Shillings. Please note that Visa requirements are subject to change and may change at short notice (though there's not been any significant changes for about 15 years). You may prefer to secure your visa through the Tanzanian Embassy or High Commission in your home country - it will usually mean less waiting on arrival too. You may be required to show a yellow fever certificate on arrival at the airport if you are travelling from or through another African country. This applies if you on flights that transfer through, for example, Nairobi or Addis Ababa. If you arrive directly from outside Africa there's no need to produce this document. It's really important to make sure that you have sufficient and suitable kit for the climb. The weather can be very unpredictable and you'll be hiking through a huge variety of climatic zones from the tropical heat at the lower levels to arctic conditions on the summit. Potentially it can be as low -20C or less with the wind chill at the summit. Sad to say that we have on occasion seen some people that have had to turn back from their summit climb because they're too cold. Don't let that be you ! Read on and make sure you are fully prepared by following our comprehensive kit list advice. Remember that your main kit bag that will be carried by one of our crew must not weigh more than 15Kg maximum. Like climbing the mountain, we'll start at the bottom and ascend to your summit. Your most important bit of kit - you'll be wearing them a LOT ! They must be reasonably sturdy, comfortable and waterproof. If you are going to buy a pair for this trek make sure you get them well in advance and make sure that you can do prolonged walks without any blistering/rubbing or other irritation. We recommend that you find an outdoor shop that can do proper fittings with knowledgeable staff. Also make sure you have plenty of room in your boots for wearing thick/multiple pairs of socks for the higher altitude days and the summit. The long descent too requires space in your boots for your toes otherwise you might end up with 'boot bang' - bruised toes and likely loss of toenails in a few weeks. for the first day you can use thin, lightweight wicking walking socks as it’s usually a hot. humid walk. Thereafter you'll be wearing medium weight walking socks and later, especially for summit night, super thick trekking socks, possibly 2 pairs on summit night depending on the type you have. Layers, layers, layers – it’s the only way to go. The ambient temperature can change dramatically especially as you reach the higher altitudes. Temperatures can change from feeling like 30C to 4C in a matter of seconds depending on cloud cover and the wind. thermal wicking base layers are good for the higher walking days, summit night and for sleeping – two would be enough. for summit night especially if using walking poles as your hands are not moving and very exposed to the elements. keeps your neck warm and will give you protection from and that cold slapping wind on summit night. Waterproofs are essential for this trek. Do not compromise on quality here getting wet at altitude can put you at risk of hypothermia and accelerate altitude sickness. Waterproof (preferably breathable) trousers and jacket. we like these. Especially while trekking on the lower slopes as you can throw it on very quickly covering your day pack, and it allows a lot of air circulation to keep you cool in the warmer climatic zones. Also if it is really heavy rain you can double up the jacket and poncho to keep seriously dry. Umbrella - extremely breathable rain protection. You really need to get this right as it could affect your chances of reaching the summit. We can’t forecast mountain conditions on any given night so you must be prepared for the worst, and believe us, it can be a -20C howling windy blizzard up there. If you don’t have a down or similar jacket you may need up to 7 layers and a reasonably thick jacket depending on the technical specifications of your kit. There are no showers on the camping routes and the camp sites are quite basic so keep it to a minimum. much as we want you to. the sting out of the face slapping wind. with an on-trend tache/beard combo. A good quality sleeping bag rated 4 season minimum is essential. Different manufacturers may use different rating systems. Your bag should have a comfort rating to at least -4C. You can add a fleece/silk liner to boost warmth too. Thermarest sleeping mat (optional). Don’t forget we will supply a thick sleeping mat each along with your tent. Compeed is recommended and plenty of it just in case. Even if you have well-worn in boots. A combination of the heat at the lower altitude the gradient of the trails and multiple longish days walking can cause your feet to sit in your boots slightly differently and play havoc with your most essential tools. We recommend bringing one or both paracetamol and ibuprofen. Ibuprofen also has anti-inflammatory properties and these 2 medicines can be taken in combination as they work through different physiological mechanisms. Some paracetamol products contain codeine. These, and any product containing respiratory inhibitors must be avoided as they will slow your breathing rate and increase the likelihood of altitude sickness. For the same reason sleeping tablets should be avoided. Some suggest using aspirin due to its’ blood thinning properties of the drug but the effect is probably insignificant in altitude situations. You may wish to include plasters/allergy antihistamines/any personal medications (which of course have already been ok’d by your doctor during your pre-climb health check). too when your legs may be wobbly with fatigue. too or you won't be enjoying hot drinks or spicy food for a few days. Sun glasses - with good UV protection. Small travel towel - we'll give you washing water daily. this will raise your heart rate. Your heart will be working hard enough ! help you be more organised at camp. You'll need some treats to pep you up. There's not much to spend your money on. At some the gates where you can buy some maps, books, dvd's At some of the gates you can also buy drinks and last minute essentials but it’s best not to rely on this and be fully prepared on leaving your hotel. While tipping is voluntary, it is normal and expected that you tip your crew if you are satisfied with the services that you receive. We follow KPAP advice on tip amounts and will give you a suggested breakdown of tipping for your climb before heading off for your trek. We calculate this on at a daily rate and per job done by your crew members. Typically you'll need to allow in the region of 200 - 250usd per climber depending on the number of days you spend on the mountain and the number of climbers and crew in your team. It's best if this is in smaller denominations. Tips are distributed at the end of your climb in a thank you ceremony where your team thank your crew and they will also thank you too. Most climbers will spend at least one night in Moshi both before and after the climb. You may prefer 2 nights prior to starting your climb to give you plenty of time to prepare for the mountain after your travel to Tanzania. We can arrange accommodation here in Moshi for you to suit your budget, from simple bed and breakfast to luxury level lodges with swimming pools. you'll need cash for meals and entertainment and any additional transport. Meals on average at mid level restaurants are around $10-15. Airport taxi transfers are $50.00 each way. There’s still only a few lodges/hotels and shops that accept credit or debit cards at present so please don’t rely on them. We do have banks with ATMs, yet again, don’t rely on them for your trip funds. Cash is still king here ! If you book a lodge through us we will advise you if card payments are available. US dollars are widely accepted, however if you are here for more than just climbing Kilimanjaro then it’s advisable to change some cash into Tanzanian Shillings (Tzs). We have many reliable bureau de change (money changers) here in Moshi with competitive rates. You may need i.d. to complete your transaction. Please note that only newer US dollars are accepted in Tanzania. They must be post 2006, (big head presidents) and in good condition. There are also slightly different rates depending on the denomination, so you’ll get better rates when changing 100usd and 50usd bills than 20’s or lower. Most major currencies are accepted but we do recommend having a supply of US dollar bills in addition to your home country currency. Please feel free to check with us if your currency is accepted before traveling.